Union County, OH has its share of touchy weather. In the summer, our sweltering heat comes married to high humidity, turning homes into hothouses. In the winter, heavy snow and freezing temperatures mean you need a heating system just as reliable as your AC. That means every aspect of care and maintenance of your systems, from installation to repair, to servicing and replacement. The experts at Quality Air Heating and Air Conditioning are ready to go when you are, regardless of your system or its needs. We stand by our work and we’re dedicated to making sure you’re happy with it, so give us a call today! When it comes to heating systems, we have a wide variety of options to choose from here in Union County, OH. Most people used forced-air furnaces or boilers, but you can also find alternative forms of heating such as heat pumps. You need a service that understands them all, and can provide expert service to install, repair and maintain them. Whether you have a traditional furnace or something more radical, whether you’ve had it for a week or twenty years, we have the skills to handle your problem! Whether you use a gas furnace or an electric model, you need it to function as it should when the snows start to fall. If yours shows signs of trouble – even if it doesn’t result in the furnace stopping – you should shut it off and call in a repair service immediately. That way, you can get the problem fixed properly instead of experiencing a bigger problem somewhere down the line. It can be easy to dismiss the sight of ice on your heat pump, especially in the winter. But that ice can be a sign that something is wrong with the system: low refrigerant, a malfunctioning fan or worse. If you spot ice on the coils of your system contact a qualified service representative for a maintenance and repair session. Indoor air quality is as important as temperature control, but every house is unique and you should know what your needs are before you begin the process. It may be that you need dust and general contaminants dropped. You might have concerns about infection and illnesses, or perhaps you need the high humidity lowered in the summers. Here in Union County, OH, Quality Air Heating and Air Conditioning can do it all! It may seem counterintuitive to have both a humidifier and a dehumidifier in your home, but like your heater and air conditioner, our varied seasons demand it. Humidifiers work in the winter, when cold air forces the moisture out and leaves your house dry, while dehumidifiers work in the summer, when muggy air can turn your home into a sauna. Ideally, an air purifier should need only a little maintenance: clearing off dust and cleaning the collection chamber periodically to keep it functioning. But chances are it will break down sooner or later, and when it does, you want a repair company that can fix it right instead of one applying a one-size-fits-all solution. Call on us to get your air purifier up and running again! Some companies only specialize in one type of air conditioning system or worse: only offer basic services to their customers. But Quality Air Heating and Air Conditioning not only covers a huge variety of air conditioning systems throughout the Union County, OH area, but offers installation, maintenance and replacement services for your system. That means you don’t need to hunt all over looking for one specific service, or worry about whether the repair technician understands your system. Give us a call and we’ll take care of everything you need! When your air conditioner breaks down, every minute can seem like an eternity, and in the hottest months of summer it can even be dangerous. That’s why we offer swift emergency repair for your home, allowing us to get the problem sorted out before you and your household melt under a persistent heat wave. Every business is different in Union County, OH, which means your commercial HVAC service must be ready to adapt to your needs. If you run a restaurant or are preparing foodstuffs, there are mandated guidelines for temperature, humidity levels and the like. Other companies need to keep computers and similar systems working, to say nothing about the comfort levels of customers and employees, which often number much larger than even the biggest residence. Call Quality Air Heating and Air Conditioning to handle any issues with your commercial HVAC system. Chances are that your business day is sufficiently full without having to add a commercial HVAC service call into the mix. When you make the appointment, you want to make sure the company on the other end can handle it without interrupting the other things you need to do. 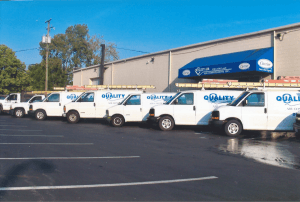 We pride ourselves on reliability and will handle your commercial HVAC repair the right way!